Your church’s ONA covenant is the beginning, not the end, of your journey of faith! An Open and Affirming church keeps its word of welcome by living according to its commitments. Your ONA covenant is an opportunity to grow, to build new relationships, and to become a visible and trusted partner with your LGBTQ neighbors and their families! Your ministry team can include members of the task force that guided your church through the ONA process, and can expand to include others who support the values of your ONA covenant. The team should meet monthly, report regularly to your congregation’s governing board, and keep the congregation informed of opportunities for ONA ministry and mission in your community. The team should work closely with committees in the congregation responsible for evangelism, worship and advocacy. The Coalition funds and resources the ONA movement, and can support your congregation as you continue on your ONA journey. Periodically ask interested members of the congregation to subscribe to the Coalition’s free print and email newsletters, either by directing them to the subscription page on the Coalition website (www.openandaffirming.org/subscribe) or by distributing this sign-up sheet. The Coalition’s information services keep ONA churches updated on the latest news and resources from our movement, and share best practices from growing ONA congregations. Participate in our continuing series of ONA webinars designed for congregations like yours. When ONA churches are visible allies, they gain the trust of the LGBTQ community and attract not only LGBTQ seekers, but also straight millennials who identify with ONA values. LGBTQ evangelism and advocacy should be a priority for every ONA congregation. Using the resources on our Evangelism page as a template, discuss ways your congregation can effectively build relationships with your LGBTQ neighbors. Contact your UCC Conference office to ask if there’s an ONA Coalition or Team in the Conference, and ask to participate. If there’s no Conference-wide ONA network, volunteer to work with Conference staff and other ONA churches to organize one. If there are a number of ONA churches in your area, plan to attend the nearest annual Pride parade as a group. If you’d like to connect with an experienced ONA church that can mentor you through your first year as an ONA congregation, contact the Coalition at ed@openandaffirming.org. Step 5: Let your light shine! Post a rainbow comma or other rainbow image prominently on your website, your Sunday bulletin, and other publications. 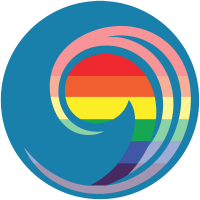 Post your ONA covenant on your website and link to the Coalition’s ONA page at www.openandaffirming.org/ona. Display a rainbow sign, flag or banner outside your church. Advertise in local media—especially before Pride Day—and include the rainbow comma as a visual that will clearly communicate your commitment to ONA inclusion. Renew your ONA covenant annually on the Sunday after your local Pride Day and be sure to publicize the event. The Open and Affirming Coalition is an independent non-profit and receives no regular funding from the national setting of the church—although we work in close partnership with the UCC’s national ministries. Since 1985, when the Coalition launched the UCC’s national ONA program, our budget has depended on contributions from individuals and ONA churches. By pledging an annual gift to the Coalition, your church will help us reach our goal: a UCC in which every congregation can offer a confident and authentic welcome to the LGBTQ community. Write the Coalition at ed@openandaffirming.org for more information. Ask for copies of the Coalition brochure and keep them in stock for your members and visitors. Without your support, we can’t strengthen and grow the ONA movement. After six months or a year, this Self-Evaluation Tool for ONA Churches will help your congregation’s leadership assess the effectiveness of your ONA covenant. Explore this website to discover new ideas for ONA mission, ministry, mission, advocacy and evangelism! Complete this survey, and see how your congregation compares with other ONA churches! If you answer “NO” to some of the questions, don’t worry! Your honest answer just means there are exciting opportunities awaiting your church! Use our Self-Evaluation Tool for ONA Churches and other resources throughout our website to discover new ways to strengthen your ONA commitment! The ONA Coalition’s executive director, Andy Lang, can lead workshops and training events for congregations exploring ways to revive or strengthen their Open and Affirming commitment. “ONA 201” includes tips for marketing, advertising, communications and advocacy, and includes a “Self-Evaluation Tool” for ONA churches that will help the congregation’s leadership answer the question, “What’s Next for our church?” Our programs are suitable for Conference or Association annual meetings, or for regional training events in local churches or seminaries. Please contact Andy at ed@openandaffirming.org to learn more. And look out for our continuing series of webinars for both ONA churches and congregations taking their first steps toward an ONA covenant.